There’s a lot more to life as a digital nomad than getting your work done from a sun-soaked island while everyone else is queueing for the water cooler. Maintaining productivity and protecting important work data can be easier said than done when you’re on the move, and you need to pair all this up with the art of living minimally so that you aren’t weighed down with luggage. You’ve got your packing cubes and you’ve installed a range of world clocks onto your phone to keep track of time zones – but have you prepared your money for international living? Not so long ago, it was enough of a struggle organizing incoming and outgoing payments across a range of currencies, before you even spared a thought for the cost of withdrawing cash around the world. Poor exchange rates and sky-high ATM fees are enough to make any digital nomad’s eyes water, but with smart banking these things are easy to avoid. Multi-currency cash cards aren’t a bad place to start, but for a better life hack, look into virtual banking. Organizations like Monzo, Starling and Revolut are making waves as ‘challenger banks’ and their total lack of fees for foreign card transactions and ATM withdrawals are just a few of the perks. Different services offer things like free international money transfers, the promise of only ever using MasterCard’s current exchange rate and the freedom to spend your money anywhere and in any currency without a hold up. Smart banking isn’t just easier than traditional banking – it can also save you serious cash when you’re on the move long-term. 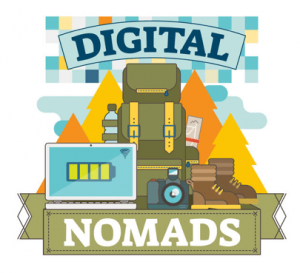 Take a look at some of the Best Mobile Banking Apps and Online Services for Digital Nomads. Public WiFi is a lifesaver if you’re out of data or the network coverage is patchy, but it’s seriously risky even for everyday use. If you’re logging on to complete client work or to organize payment transactions, the lack of sufficient encryption provided by public connections can put your data within easy reach of hackers. But if you’re prepared, there’s no reason you can’t still get online. When it’s time to connect from the airport, train station, hotel WiFi or yet another coffee shop, make sure you’ve got extra security in place. Installing a virtual private network app is a really easy way to ensure that even when you’re using a network that’s a little suspect, anything you send and receive stays hidden in a layer of encryption. It’s not a glamorous aspect of working internationally, but it’s a great way to feel confident that the things you’re transferring online aren’t being accessed by anyone but you and the intended recipients. Take a look at more security tools to work remotely. Most of us are guilty of over-packing to a certain extent. Whether it’s for a weekend or a week, there’s always something in the suitcase that goes unused – and when you’re living out of bags indefinitely, it can be pretty hard to know what to pack and what to leave behind. As a general rule, any time you pack, you should also unpack and re-pack. Not for the sake of killing some time, but because in the process of going back over everything you initially felt was definitely worth it, you’ll often spot an item or two that isn’t as essential as you first tried to tell yourself. Do take a portable powerpack, do take a spare charging cable – but think seriously about how much clothing you actually need, particularly if you know you’re staying in apartments or guesthouses where laundry facilities will never be far away. Instead of phrasebooks, download a translation app. The less you pack, the less you have to carry, so embrace your inner minimalist and learn to make a little go a long way. Trying to maintain a decent work-life balance can be enough of a challenge when you work an ordinary 9-5 and go home to the same place at the end of every day. When you’re bouncing between time zones and don’t have set shift patterns, it’s easy to forget to give yourself a proper break. The mantra for many digital nomads is “work fast, travel slow”, and it’s true that the more efficient you can be, the more time you’ll get to spend enjoying your various surroundings. When workloads are high and deadlines are looming, taking a break can feel counterintuitive – but if you don’t force yourself to rest, your efficiency and the quality of your work can take a hit. Little things like disabling email notifications outside of a given range of working hours can make all the difference, along with using timer apps to monitor how long you’re spending on certain tasks. Finding the balance isn’t all about your work day, either. Check out networking apps and events for expats and international visitors in each location you stop in – as well as being a great way to find things to do, simply knowing what’s out there can help motivate you to step away from the laptop for a while. Take a look at out our digital nomads guides where you’ll find coworkings and communities in some of the most popular digital nomads destinations, such as Bali, Chiang Mai, Medellin, Barcelona, Berlin, Lisbon and more! Finally, the simplest way to avoid some catastrophes is to have backup. More specifically, offline backups of your work documents. While we all hope we don’t see the day that a work device goes AWOL abroad, or gets hijacked by ransomware because of an unsecured connection, it does happen. Cloud storage can be useful for re-installing documents from a stolen device onto a replacement, but without an external hard drive you could still find yourself locked out of your files in the event of a computer virus. External hard drives are getting cheaper every day, and come in lightweight, pocket-sized options that are perfect for travel. Backing up important data offline takes very little time, but can be the difference between losing files forever and having them back in no time at all in the event that disaster ever does strike. Take a look at productivity related tools to facilitate remote work. If you found these tips helpful, you might also want to check out our Big Digital Nomad & Remote Working Resources Guide.